In less than a month, NDP activists and party supporters across the country will gather in Ottawa, on the unceded and unsurrendered territory of the Algonquin people, to discuss and debate policy proposals at the annual NDP convention. Among those being debated is a resolution put forward by Palestinian solidarity activists and their allies concerned with peace and justice for Palestinians. If passed, the policy would lead the NDP to become the largest Canadian political party advocating for the use of diplomatic and non-violent pressure to end Israel’s military occupation of Palestinian lands. It would position the NDP as one of the few parties demanding a fair treatment of Palestinian refugees’ right of return, an end to the Gaza blockade, and the labeling and banning of illegal settlement products. In adopting this resolution, the NDP would be in step with the Canadian labour movement, following the examples of unions like Unifor, the Canadian Union of Postal Workers and the Quebec union federation CSN (Confédération des syndicats nationaux), together representing hundreds of thousands of workers across the country. The NDP, as the party of labour justice here and abroad, must follow suit and respond to the call of Palestinian workers and aim to implement policies that seek to end the occupation that systematically violates workers’ rights in the region. Passage of the resolution would represent an important shift within the NDP, one that departs from former NDP leader Thomas Mulcair’s steadfast support of Israel and stifling of candidates in support of Palestinian justice. Most importantly, however, it would present a departure from the usual milquetoast policy position, rife with unequal power relations, towards one grounded in international human rights law. The shift within the NDP accompanies a growing tide of Jewish activists, and in particular young people, who are actively condemning Israel’s policies of occupation to firmly and unequivocally state: not in our name! 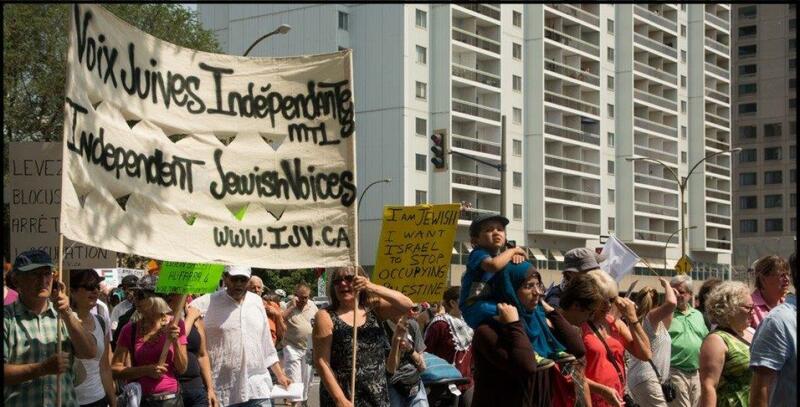 Independent Jewish Voices Canada (IJV), a national human rights organization of which I am a part, was extensively involved in drafting and promoting the resolution. IJV offers its full support of the resolution as it aligns with our mandate calling for the application of international law and respect for the human rights of all parties in promotion of a just resolution to the conflict in Israel and Palestine. IJV is not alone in this. Across the world, more and more Jewish people are finding it increasingly difficult to justify Israel’s two-tier legal system, which manifests itself in a 700-kilometer separation wall, routine checkpoints, and an ongoing military occupation and blockade. And how can we? How can we reconcile the Jewish principle of tikkun olam, or repairing the world, when 16-year-old Ahed Tamimi and 700 other child prisoners languish in Israeli military prisons each year? In her open letter, author Marison Garson writes of the progressive Jewish community in the United States: “You are not immune to others’ suffering, so how can you be a spectator at the suffering inflicted in your name?” The same must be asked of the Canadian Jewish community. For when Jews speak out against Israel, we stand in stark defiance of the very ideological scaffolding on which contemporary Zionism rests: that to be Jewish means to conform to a narrow, monolithic narrative of Jewishness, one that conflates Judaism and Zionism and advocates for the maintenance of ethno-nationalism over the freedom and basic rights of Palestinians. In the Canadian context, it is imperative to acknowledge that movements for Palestinian and Indigenous liberation remain fundamentally and inextricably linked. The struggles of Indigenous peoples in Palestine, as well as in what we now called Canada, are rooted in a shared history of forced displacement and territorial dispossession, as well as ongoing resistance to militarism, land and resource theft, and settler colonialism. As Canadians living in a parallel settler-colonial society to Israel-Palestine, we need to acknowledge and oppose these colonial processes here and abroad. As a Jew and a settler, I feel it is incumbent to speak out and to actively condemn and dismantle these structures of oppression at home across Canada and those being perpetuated in my name across Israel-Palestine. Now is not the time for cautious centrism. In a time of unparalleled and intersecting social, environmental, and economic crises, it is of paramount importance that the NDP stand with and take direction from marginalized communities and those fighting for peace and justice everywhere. Not only is this right, it is also what the overwhelming majority of Canadians want. As a recent poll illustrates, 84 per cent of New Democrats and 66 per cent of Canadians believe it is reasonable to sanction Israel for its military occupation and settlement program. The NDP has a long and poignant history of standing in solidarity with marginalized and otherwise oppressed groups. We must ask ourselves: why is standing for the rights of Palestinians any different?